India is a very diverse country, but its diversity is amplified due to presence of hundreds of dialects, tens of languages spoken and about dozens of different scripts that are used to write these languages. While there are quite a few people in India who can understand or know to speak more than 5 different languages, there is hardly anyone who can write more than 2 scripts apart from English. Due to this, communication becomes a major issue between people from across the states. This scenario may change soon, if an ambitious project undertaken by IIT Madras Professor becomes successful. Prof. V Srinivas Chakravarthy has applied a patent for unified script that unifies 22 different Indian languages. The script has been created with a simple goal of enabling communication in all languages via a single script. In simple terms, this Bharti script is derived from sounds made by words that we used in all languages. Existing Indian scripts have a issue, they are quite complicated – even a small change in sound may need a completely different letter. Bharti Script removes this problem by creating only a small change in alphabet based on difference on how it sounds. 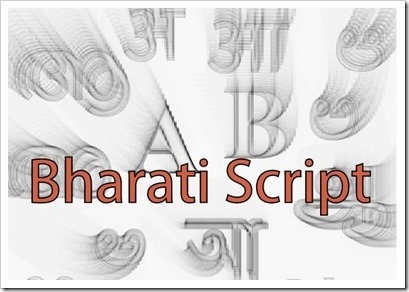 The most appealing aspect of Bharti script is its simplicity – According to prof. Chakravarthy, anyone with a knowledge of a single Indian language can learn Bharati script in matter of couple of hours. Prof. Chakravarthy told us that he has already applied for patent and will be unveiling the language in few weeks time. What do you think? Will this unified language work? "Single Script That Unifies All 22 Indian Languages [In Conversation With Creator]", 5 out of 5 based on 1 ratings.